It's February and it's love month! And its more special to celebrate the love month with the whole family on a very cool place to visit here in the Philippines, Tagaytay City! Planning to have a vacation these February? Join my February giveaway and win prizes perfect for some nature-tripping and a gastronomic adventure! 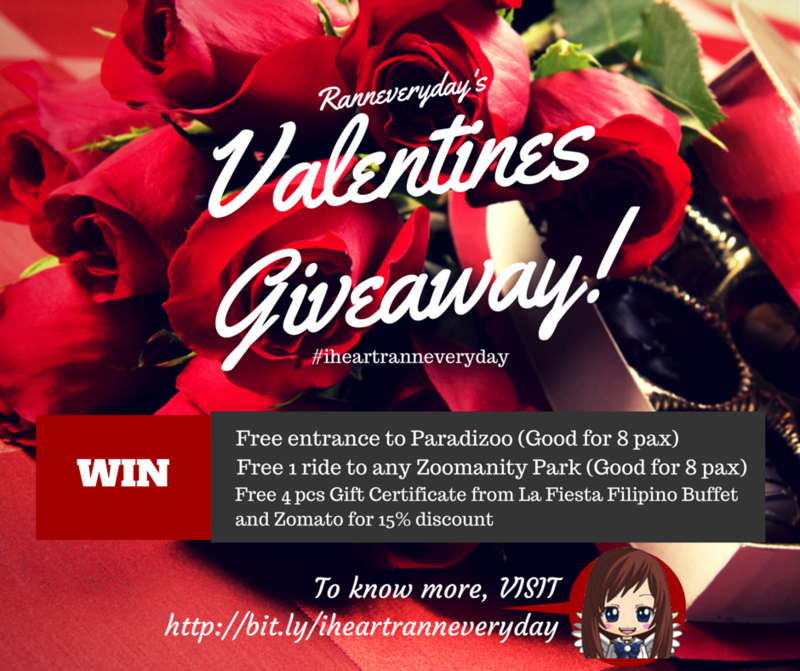 Win the following prizes from Ranneveryday's Valentines Giveaway! 4 pcs tickets to Paradizoo free entrance (each ticket is good for 2 pax. 4 pcs is good for 8 persons). 4 pcs tickets Free 1 ride per person for any Zoomanity Park (each ticket is good for 2 pax. 4 pcs is good for 8 persons). 4 pcs Gift Certificate from La Fiesta Buffet and Zomato. Each GC entitles the holder for a 15% discount on their rates. This giveaway will start on February 2, 2015 until February 14, 2015. We will be choosing the winner on the next day.